Johnston Carmichael is to enhance its integrated employment solutions offering with the strategic appointment of Richard Britten. Mr Britten (pictured), a seasoned tax and national insurance professional, has accumulated more than 20 years’ experience in international tax and employment taxation while working with firms including Arthur Andersen and Deloitte. Most recently, he held the role of tax partner at Aberdeen-based Anderson Anderson & Brown (A2B). 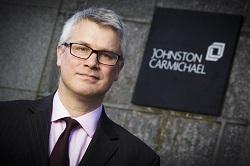 Joining Johnston Carmichael’s Aberdeen office as tax director, he will be tasked with building Johnston Carmichael’s employer solutions practice for companies with internationally mobile employees. In particular, he will focus on translating technical challenges into practically led solutions, through a comprehensive suite of employer solutions offerings. Mr Britten takes on a firm-wide and global advisory role through Johnston Carmichael’s membership of PKF International, which will see him work closely with on-the-ground global contacts to provide international advice and solutions. The appointment comes as the firm builds capability to support oil and gas service businesses deliver commercially viable contracts beyond the North Sea, to a wider international market place. The employment solutions offering will enhance the firm’s credentials across a number of key sectors, including financial services, shipping and food & drink, however will be particularly relevant to the global oil and gas sector in light of new employment intermediaries legislation coming into effect in April 2015. This will require new reporting to HMRC and will impact many contractors. Mr Britten said: “A number of changes are set to come into place in a matter of days which will impact internationally mobile employees. Whilst the new rules are generally helpful in the long term, tax liability may also increase, creating a more complex tax and remuneration regime for companies with employees mobilised around the globe.